The breeding distribution and habitat requirements of the Lesser Whitethroat in Strathclyde. The Lesser Whitethroat Sylvia curruca is a relatively common breeding bird in England with a breeding population of around 64,000 pairs (BTO). Breeding habitat is defined by mature thorn scrub usually found in chalk downland, disused railway lines, mineral workings, coastal heath, regenerating woodland etc. High breeding density is located south from a line running from the Humber to the Severn estuary (Gibbons et al. 1993). The further north and west one travels in the UK, Lesser Whitethroat breeding density diminishes. However, during the late 60’s and 70’s English peripheral range expansion started in Northumberland in 1962, Cumbria in 1970 and Devon & Cornwall in 1977 (Marchant et al. 1990). In Scotland, 1st county breeding records occurred in Mid Lothian in 1974, Aberdeenshire in 1977, Angus in 1981, Borders in 1982, Strathclyde in 1983, Dumfries & Galloway in 1985, West Lothian in 1985, Caithness & Orkney in 1988, Shetland in 1993 and Sutherland in 1998 (Scottish Bird Reports 1974-98). The Lesser Whitethroat is still a relatively scarce breeding species in Scotland, with a breeding population estimated at around 400 pairs (Byars 2007) half of which are located in the SE corner, the Lothian coast in particular. From a European perspective, the breeding range of the Lesser Whitethroat has also been expanding northwards and westwards. In Norway, there has been a definite expansion of the breeding range (S. Eldøy pers. comm.). Northern Ireland could be on the verge of having its first breeding record, for a singing male was located in suitable habitat during May 1985 (Irish Bird Report 1985). These records suggest that the species is undergoing a marked range expansion into northwest Europe. Since 1983 I have surveyed suitable habitat throughout the Ayrshire and Clyde recording areas, searching for singing males and suitable breeding habitat. The presence of a pair or a singing male noted on two occasions a week or more apart and occupying the same territory on two or more consecutive years was taken as evidence of breeding. All potential breeding records obtained from bird reports were also investigated during the study period. Seven of these regular breeding territories were examined to determine their habitat structure and plant species composition. To investigate why certain areas of superficially similar habitat did not contain Lesser Whitethroat territories, seven habitat sites were chosen as controls. These sites never held breeding Lesser Whitethroats during the study period. This allowed us to investigate why there none and to examine the vegetational differences between occupied territories and control sites. Lesser Whitethroat territories were recorded in areas where mature hawthorn Crataegus monogyna scrub was interspersed with a dense mosaic of bramble Rubus sp., dog rose rosa canina, gorse Ulex europaeus and is some cases willow Salix sp. These five plant species were particularly prevalent in all occupied territories and the control sites. Such scrub areas usually formed habitat islands surrounded by pastoral farmland. The seven territories studied were uniform in several respects. They were either found on disused railway embankments or on regenerating hillside scrub. All areas were practically impenetrable, making vegetation analysis extremely difficult and painful! Perhaps it also explains why so little is known about the breeding biology of this species. When suitable breeding habitat was discovered in a surveyed area, thirty minutes were allocated to detect any singing males. If no song was heard within that time, a ten minute long tape lure was played twice with a five minute interval in order to elicit a response. Whenever an occupied site was located, another two visits a week apart were made to establish site fidelity. Observations continued throughout May to determine territory size and habitat utilisation. At the end of July, when the breeding season was over, ten randomly spaced transect lines were placed in each territory. Four one metre square quadrats were placed at 5 metre intervals along these lines. In each quadrat, the percentage cover of the five dominant plant species, hawthorn, bramble, dog rose, gorse and willow, were estimated from ground to canopy level in four one metre height bands. The data recorded from these vegetational surveys were then used in multivariate analyses to describe the habitats in terms of all the plant species combined, rather than just one species at a time. The best time to search for breeding Lesser Whitethroats was found to be during early May when the males were extremely vociferous and highly conspicuous throughout the day. Peak song periods tend to occur between 7.00 – 11.00 and 14.00 – 17.00 and during warm, sunny settled weather conditions. Males sang almost constantly from exposed sprays high up in the scrub canopy or during feeding forays along the edge of the scrub. At times the Lesser Whitethroat was found to be the loudest songbird in the vicinity and the penetrating rattle could be heard up to 220 metres away. Our observations over the study period have shown that singing is quite intense from the last week in April to the first fortnight in May. Peak song phrases can be as high as 250 - 300 song phrases per hour. Once mated however, out put of song phrases almost comes to a complete stop with males only singing 1-3 song phrases per day. This can give the false impression that known occupied territories have failed as they can appear totally deserted and devoid of song. Since breeding Lesser Whitethroats have such a short song period (4-14 days) in the majority of breeding territories, the time in which one can locate singing males is extremely limited. Females were much harder to locate, as they tended to skulk in the thickest cover. Males however provided a good indicator to their presence, as they became almost apoplectic in finding a female passing through and would vigourously chase and frantically display to them. Males would also sub warble more and both sexes would give out a strange high pitched squeak note, always low down (< 2m) and hidden in dense scrub. Our observations indicated that males which are still singing by the end of May, June and July are still unmated or have failed in their nesting attempt. We call these transient males and they have a characteristic tendency to sing around the periphery of established breeding territories, or sing in totally unsuitable breeding habitat. Male Lesser Whitethroat holding territory. The seven occupied territories are listed, along with some descriptive data, in Table 1. Only 2-3 breeding territories were recorded in Renfrewshire during the study period, and all were within a kilometre square. These sites were two disused railway tracks near Dykebar and a disused limestone quarry at Brownside Braes, Paisley. Ayrshire was the major stronghold of the species in Strathclyde, with 6-8 breeding territories annually since 1985. Sampled sites were located at Heads of Ayr, Burton farm and Bracken Bay. 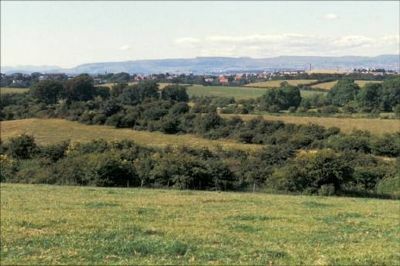 In Lanarkshire, only one regular breeding territory was located and that was at Baron’s Haugh, near Hamilton. Site 1, Dykebar railway track: One small regular breeding territory, located in the overgrown hawthorn scrub (4m+). With an extensive mosaic of bramble, dog rose, gorse and willow understorey on the embankments, both north and south facing. Site 2, Dykebar railway track: Another small territory, again located on a nearby railway track which runs alongside site 1. The habitat is similar too, with mature hawthorn (4m+) and a dense understorey of bramble, dog rose, gorse and willow; both north and south facing embankments. Site 3, Disused limestone quarry: A large territory of which the boundaries cover the entire quarry area. The habitat is mainly mature hawthorn scrub (4m+) with a dense shrub layer of bramble, dog rose and gorse. The site is situated on a north facing slope. Site 4, Heads of Ayr: This site could almost be regarded as a colony because up to three pairs vied for territory each year in a confined area of suitable habitat. The site contains both mature hawthorn (3-4m+) and dense patches of blackthorn (2-3m+), the latter in good quantities. Although the understorey contains bramble, dog rose and gorse, it is patchy throughout the site. The site is situated on a NNE facing slope. Site 5, Burton farm: a large territory, situated in regenerating hillside scrub on a north facing slope. The habitat comprises mature hawthorn scrub (3m+) with an extensive and dense understorey of bramble. Site 6, Bracken Bay: a regenerated section of the disused railway embankments provides an extensive territory for just one regular breeding pair. The site contains mature hawthorn (4m+) and a mature stretch of blackthorn (2m+). The understorey is mainly gorse with small bramble patches on the north and south facing embankments. Site 7, Baron’s Haugh: one small territory located on raised embankments, facing east and west. The territory was in mature hawthorn scrub (3-4m+) with an impenetrable shrub layer mainly of bramble, dog rose and gorse. Table 1. Features of the study sites with occupied territories. Disused railway tracks at Dykebar, Renfrewshire, where the first county breeding record occured. Heads of Ayr, Ayrshire, between 2- 3 pairs regularly breed here. Site 8, Dykebar disused railway: A large area of open hawthorn scrub (3-4m+) with extensive gorse and bramble understorey, situated on a north facing slope. Site 9, West Brownside Braes: A smaller area of open hawthorn scrub (3-4m+) with a dense gorse understorey, again situated on a north facing slope. Site 10, East Brownside Braes: Raised embankments covered with mature hawthorn scrub (3-4+) with sparse bramble, dog rose and gorse understorey. The embankments face north and south. Site 11, Dalry coal shale bing: Overgrown hawthorn scrub (2-3m+) with mixed bramble, dog rose and gorse understorey on a SE facing slope. Site 12, River Caaf: Mature hawthorn scrub (2-3m+) with sparse bramble, dog rose and gorse understorey on a steep south facing slope. Site 13, Kilwinning disused quarry: Extensive hawthorn scrub (3-4+) with poor bramble and gorse shrub layer. Site 14, Rowanside burn: Open hawthorn scrub (3-4m+) with extensive gorse, bramble and dog rose understorey on a steep south facing slope. Class A, Mixed: hawthorn rather sparse, but with large amounts of miscellaneous species at all height bands up to 4m. Class B, Dog rose: again hawthorn is sparse and main plants are dog roses up to 3m high. Class C, Hawthorn: dominated by dense hawthorn up to 4m high, with little of other species. Class D, Hawthorn/Bramble: much hawthorn up to 3m high and dense bramble in 0-1m height band. Class E, Bramble/Gorse: fairly dense bramble up to 1m high and dense gorse up to 2m high, with very little hawthorn. 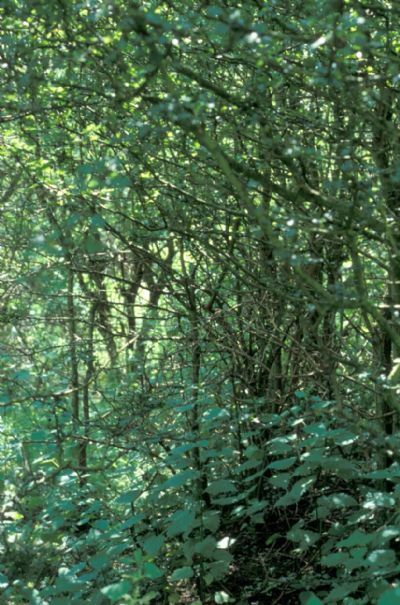 Class F, Bramble: no hawthorn at all, but very dense bramble up to 1m high and fairly dense up to 2m, together with miscellaneous species. Class G, Willow: characterised by dense willow, especially in 3-4m height band, but also with some miscellaneous species at ground level. Class H, Willow/ Dog rose/Mixed: dog rose up to 1m and willow between 2m and 4m, but with dense miscellaneous herbs below 1m. The occurrence of these classified samples in the occupied territories versus the unoccupied control sites is shown in Table 3 and we found there to be a significant difference in plant community structure between occupied and unoccupied sites (X² = 23.24, 7 d.f. , P<001). So there were differences between the two groups in terms of the combination of plant species. Of particular interest is the more frequent presence of bramble-containing classes in the occupied territories (especially Class F). Table 3. Comparison of the occurrence of samples in the different vegetation classes between occupied and unoccupied sites. Values in the table are the numbers of samples in each category (e.g. 12 samples in vegetation class A were in occupied territories) and the relationship between vegetation types and occupied/empty sites is statistically significant (X²= 23.24, d.f. =7, p<0.001). We also used another technique (linear discriminant analysis) which indicated significant differences between occupied and unoccupied sites in the 0-1m, 1-2m, and 2-3m height bands. While these differences depended much on hawthorn, it is the combination of all five plant species which differentiates the territories from the control sites. In particular, in the 0-1m height band, it is the mosaic structure of hawthorn, bramble, dog rose, gorse and willow which influence the suitability of habitat for the Lesser Whitethroat. Important open mosaic structured nesting habitat in a typical Lesser Whitethroat territory. Dense mature hawthorn canopy blocking out sunlight. This results in poor quality nesting habitat found at the control sites. The Lesser Whitethroat is a rare breeding warbler in Strathclyde, where a small population of only 9-12 pairs manage to hold territory on a regular basis. The majority are confined to just three main sites in the entire region. Ever since the initial colonisation of 1983, this small breeding population has not increased significantly. By contrast, in the Lothians the species has consolidated and expanded in terms of both breeding distribution and of the number of regular breeding pairs. A 1735 ha study site in East/Mid Lothian, held around twenty territories in 1984 (da Prato1985). In 1989 there were 47-53 territories in the Lothian region, according to the Lothian Bird Report (McGarry 1989). The reasons why the Lesser Whitethroat has not had the same level of success in Strathclyde, could be linked to three major factors. 1. The Lesser Whitethroat is on the northwesterly extremity of its European breeding distribution, therefore adult birds arriving back to breed in Strathclyde must be in such low numbers that they cannot sustain new colonisations elsewhere. This happened in Renfrewshire in 1990, when breeding Lesser Whitethroats failed to arrive back in Renfrewshire for the first time in eight years. This left three vacant territories in suitable habitat. If there were surplus birds in the vicinity, it is reasonable to assume that the territories would have been filled before the end of May. However, the only bird that did appear was a transient male, singing during late June. limited breeding distribution of the Lesser Whitethroat in Strathclyde. Lesser Whitethroat’s breeding requirements. This may restrict the breeding population in the west through climatic effects on prey availability. Mason (1976) suggested that range limitation of this species in Britain may be related to diet. It is interesting to note that the distribution of Lesser Whitethroats in the Lothian region shows a clear affiliation with the occurrence of the climatic zone known as EE. This zone represents a warm dry lowland region below 200m (Birse 1971); and in Strathclyde the only other similar climatic region is located on a tiny narrow coastal strip which includes the Heads of Ayr. Our studies suggest six important aspects found in all of the seven recorded territories. 1: It is the integrated effect of all five plant species in forming the dense mosaic structure, especially at the 0-1m height band, which appears to be a breeding requirement for the species. 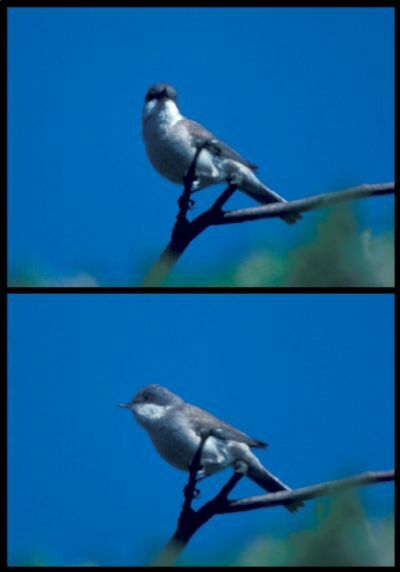 This preference for mosaic habitats reflect similar findings in Finland, where Haila et al (1987) found that the Lesser Whitethroat is adapted to habitats with a mosaic-like structure. 2: All seven recorded territories were below the 100 metre contour line. Although there may exceptions, we found that there is a general lack of suitable breeding habitat above 100 metres in Strathclyde. This may be because poor soil quality or exposed ground is unsuitable for the optimum growth of hawthorn scrub. This factor could be important in terms of national distribution, as colonisation in general may be confined as a result to areas below 100 metres. 3: All seven recorded territories were situated on a sloping surface, either on steep hillsides or disused railway embankments. This may be an indication that ideal hawthorn habitat requires a well drained soil for optimum growth and plant species diversity. da Prato (1980) suggested that Lesser Whitethroat territories were specifically located on warm south facing banks. 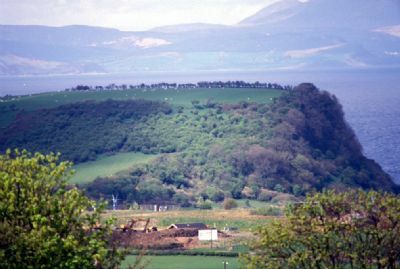 However, we found no correlation between south facing slopes and territory location; in fact the three territories at the Heads of Ayr were situated on a NNE facing slope. 4: Grazing farm animals were denied access into the recorded territories by means of wire fencing or by the sheer density of the scrub itself. Many times we would spot from a distance what appeared to be extensive hawthorn canopy only to discover that once beneath the “pristine” canopy, there lay a completely denuded zone from ground level up to one metre. Such areas had evidently been grazed by sheltering cattle and so rendered useless in terms of breeding habitat. 5: The mature hawthorn canopy was found to be 3-4 metres in height and open in structure. This feature of hawthorn canopy may be important for the warblers’ spatial feeding requirements (cf. da Prato 1980). 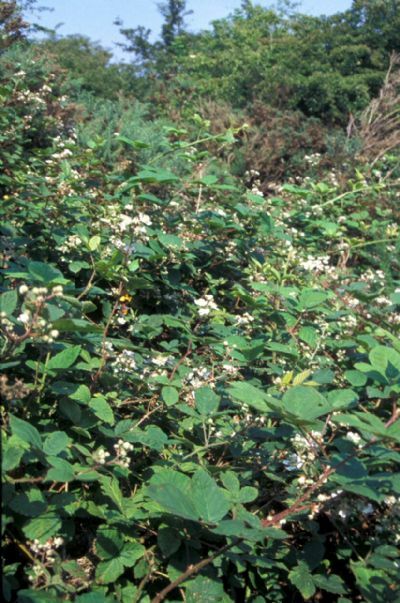 6: Dense bramble patches were present in all seven territories with good coverage in the 0-1 metre height level. We believe that bramble is an essential component of Lesser Whitethroat breeding habitat in Strathclyde (see Table 3). According to the information from BTO nest record cards (Mason 1976), the average nest was in the 0-1 metre height band. This may explain why that particular height band differed in vegetation comparison between occupied territories and control sites. The nest record cards indicate that, of the eight plant species recorded, the highest proportion of nests (47%) were located in bramble. According to Barlein et al . (1980), there are great regional differences in the plants in which Sylvia warblers nest across Europe. They stated that bramble has a unique significance as a nest bearing plant for four British Sylvia warblers, including the Lesser Whitethroat. If the Lesser Whitethroat is to increase from the known population of 9-12 pairs in Strathclyde, the species might have to expand into inferior habitats. Suitable breeding sites are few and far between in Strathclyde and, if the species has saturated all the available habitat, this could be the reason why the population has remained constant for eight years. Bairlein, F., Berthold, P., Querner, U., Schlenker, R. 1980. The breeding biology of the warblers Sylvia atricapilla, borin, communis and curruca in middle and northern Europe. J. Ornithologie. 121: 325-369. Brazier, H., Dowdall, J.F>., Fitzharris, J.E. & Grace, K. 1985. Irish bird Report. 1985. Haila, Y. & Hanski, I.K. 1987. Habitat and territory overlap of breeding passerines in the mosaic environment of small islands in the Baltic. Ornis Fennica. 64: 37-49. Hill, M. O. 1979. TWINSPAN – a FORTRAN programme for arranging multivariate data in an ordered two-way table by classification of the individuals and attributes. Cornell University. Ithaca, N.Y.
Hogg, R.D. (ed). Scottish Bird Reports. 1983-1990. Marchant, J.H., Hudson, R., Carter, S.P. & Whittington, P. (1990) Population Trends in British Breeding Birds. BTO, Tring. McGarry, O. (ed) Lothian Bird Report. 1989.
da Prato, S.R.D. 1985. The breeding birds of agricultural land in south-east Scotland. Scottish Birds. 13: 203-216.